The monthly planing hacks are 60 minute facilitated real-time planning session held towards the end of each month via zoom. 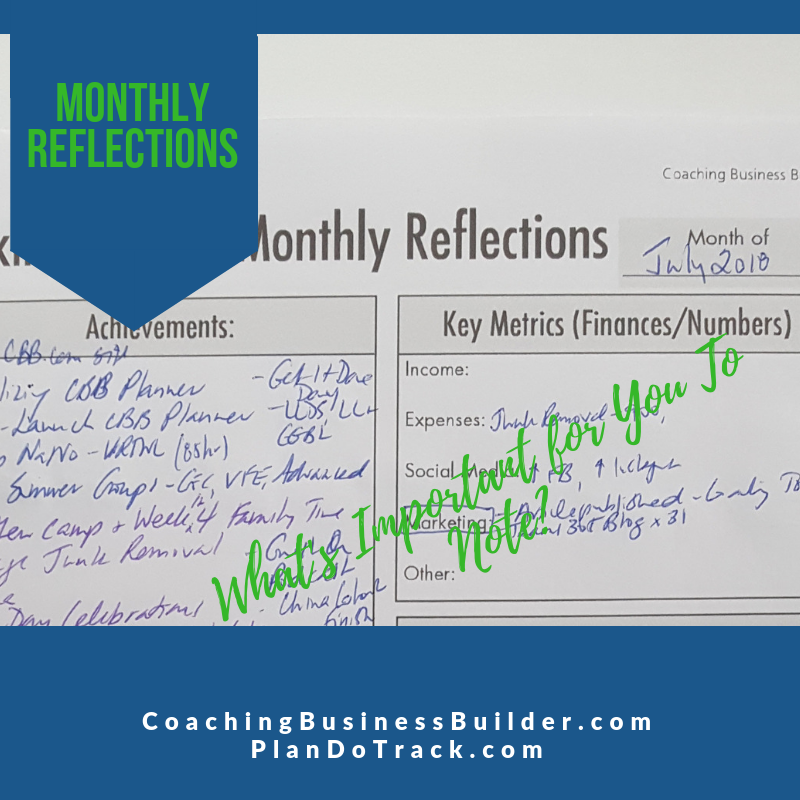 Join coach Jennifer Britton to move through a structured real-time process to review your month (your accomplishments, lessons learned) AND to plan for the month ahead. We know that time spent planning helps with focus, prioritization and productivity. Bring your planner with you and be ready for a quick flowing session with Jennifer and others. Cost: $39 US per month or join Jennifer for all remaining 2019 month end sessions for $275 US (use the link to your right to register. Looking for ongoing support and accountability around your business development? 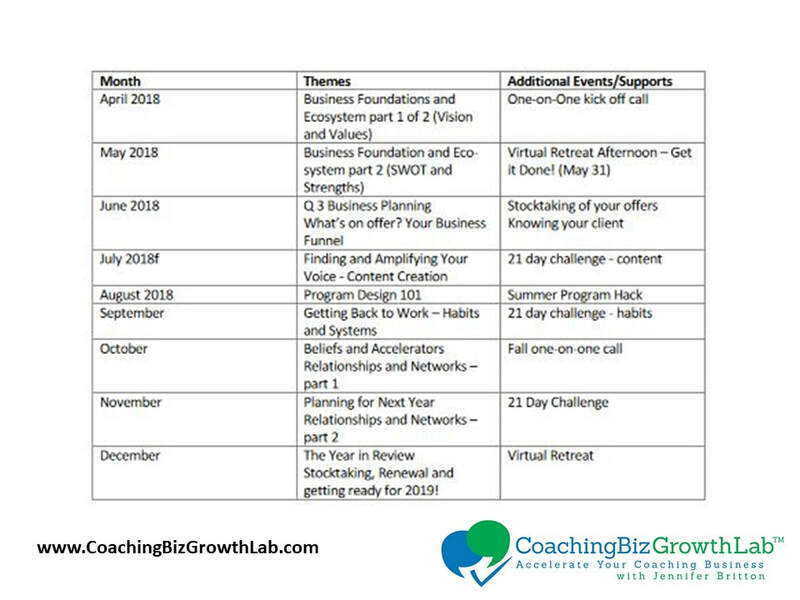 Join Jennifer Britton for the Coaching Biz Growth Lab, a group coaching program, where we focus on supporting you and your business goals. Each call is different but brings a coaching conversation to the table - whether we explore current business opportunities or other topics such as expanding your digital footprint and presence, getting organized, expanding your network or managing your time. Group members have access to a growing library of monthly articles and templates. 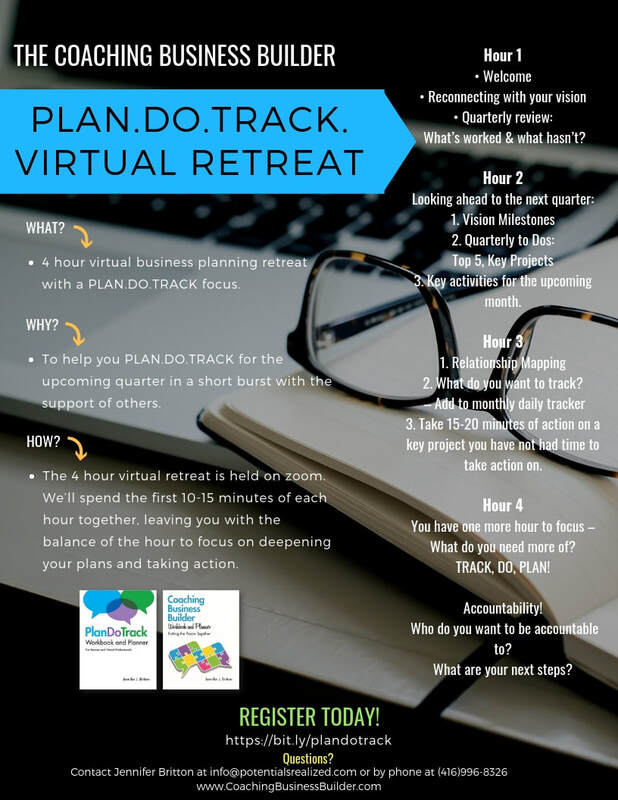 The PlanDoTrack Virtual Retreats started in fall 2018 and provide you with a structured process to take action around key projects you are working on. Each hour has a different focus across the spectrum of Planning, Doing and Tracking. Undertake Key Marketing Activities (web design, blog writing). Jennifer hosts 1-2 of these a quarter given their popularity. Check out the dedicated PlanDoTrack Virtual Retreat Page for registration and more information. Since 2007 Jennifer has been hosting a series of Virtual Business Planning Retreats where you work real-time on your business and different program elements. Virtual Business Planning Retreats are held on zoom for 4-8 hours. Coaches are involved in taking action each hour on different parts of their business. Short on time? 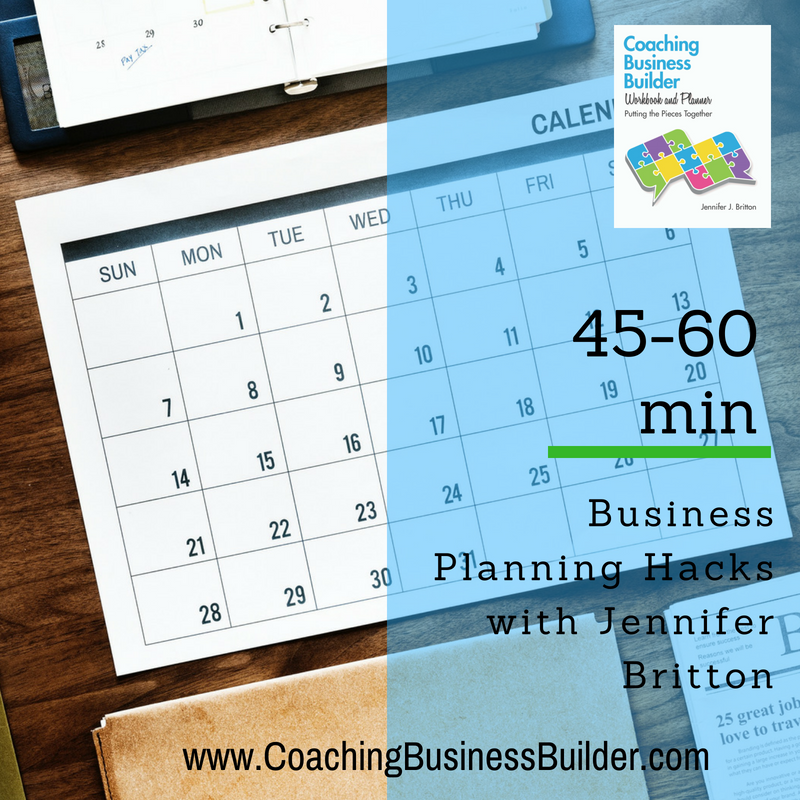 Join Jenn for a condensed planning session. The CBB Planning Hacks run for 45 - 60 minutes and are held on zoom. Using the Coaching Business Builder Workbook and planner you'll move through real-time planning activities. Hacks will be dedicated to different focus areas - monthly planning hacks, monthly reflection hacks, annual planning, content planning. Stay tuned for our schedule! Introductory hack pricing $25 US for a 45 minute session. These sessions are geared to support you in creating programming skeletons in short bursts of time. They are hands-on, reflective planning sessions which move through a series of real-time prompts. Participants should have a project or program in mind to work on, and will need to bring a pen and paper to this quick moving program planning hack. Questions or want to be invoiced directly? Email Jennifer at info@potentialsrealized.com. Call her at 416-996-TEAM (8326).